She is a UKCP registered integrative psychotherapist who works both in private practice and for five years was a Trauma Therapist at Watford General Hospital. She is a registered EMDR Europe Accredited Consultant, specialising in post-traumatic stress and she has a training from The Tavistock Clinic, in working with the dying and bereaved. 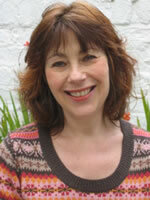 She is recognised as an accredited psychotherapist by some private medical insurance companies. She is a founder member of the London Association of Primal Psychotherapists and of The Relational School of Psychoanalysis and Psychotherapy in the UK. She has over 25 years of experience of working with individuals and groups both here and in Scandinavia. She has published articles in books, journals, newspapers and magazines on a wide range of psychological and social issues.